Who doesn't love the taste of a homemade pizza? Most of us have never tried making it oursleves before because the process to get that yummy slice of heaven sounds daunting... but it's not! It's cheaper than ordering out ($$$) and you can top it with whatever you want (leftovers!) or you can have it as plain as you would like. Another fun fact: It takes longer to heat up the oven than it does to bake a pie. It's getting to the finished result that takes effort. If you want a truly superior pizza, you’ve got to take matters into your own hands. Batali mixes together flour, yeast, extra virgin olive oil, and “blood temperature” water (that’s 96-98.6 degrees) for a perfect crust. A couple tablespoons of sugar helps activate the yeast and makes for a crispier crust. There’s no way around it: Kneading your dough by hands will give it the best texture. Besides, says Batali: It’s a great upper body workout (You won’t get biceps like that at a gym). The dough will look shaggy before you begin kneading it, but it comes together quickly: You’re done kneading when the dough feels cohesive and firm. After that, let time do the work. Place the kneaded dough in an oiled bowl, cover with a warm towel, and let it triple in size in a warm place. Partially baking the crust will ensure that it can stand up to all of the toppings. Heat a cast-iron pan or nonstick pan over a medium-high pan, then add your stretched dough. Once the crust begins to bubble and turn light golden-brown, remove it from the heat and top away. The difference between a par-baked crust is all in the texture: crispy and chewy, rather than soggy and limp. Nobody likes a limp pizza crust. When it comes to toppings, simplicity is best, says Batali. Don’t like sloppy pizza? “Don’t overdress it.” That extra-cheese pizza is “no buono.” Choose a few quality ingredients like mozzarella, in-season tomatoes, or fresh basil, and practice restraint when decorating your crust (that goes for the sauce, too). Besides, you spent so much time on the dough! Don’t let it get lost under a mound of mozz. This trick from restaurant kitchens makes a big difference, and it also couldn’t be easier: Poach your ingredients slowly in olive oil (don’t let the oil get too hot or smoke). Batali likes to use garlic and fresno chiles, but the possibilities are endless. Not only will your toppings be more unctuous and rich-tasting, you also got some great flavored-oil out of the deal. Win-win. You’ll never see an Italian grandmother chopping herbs, says Batali. Rather than hack at a bunch of basil, simply tear it gently with your hands over the finished pie. The herbs won’t get bruised, and you’ll have a fresher, better pizza. Now that we know all of these great tips, we asked our fans on Facebook and our owner, Kerry Comollo, what their favorite homemade pizza recipes are. -Cubed tomatoes, zucchini noodles (! ), and bits of filet. I put Serrano pepper powder in the dough. It was pretty yum. Carmelized onions, gargonzola, pil cured olives, red pepper flakes, and mozzerella. Do you have have a favorite pizza recipe? 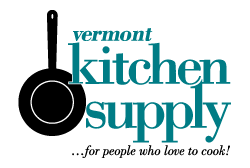 Send it us at cooking@vermontkitchensupply.com and we'll feature here on our website.